TSPSC TSRTC Junior Assistants Merit list Results 2019. TSPSC TSRTC Junior Assistants Results 2018 declared @ tspsc.gov.in and check merit list results at official website. 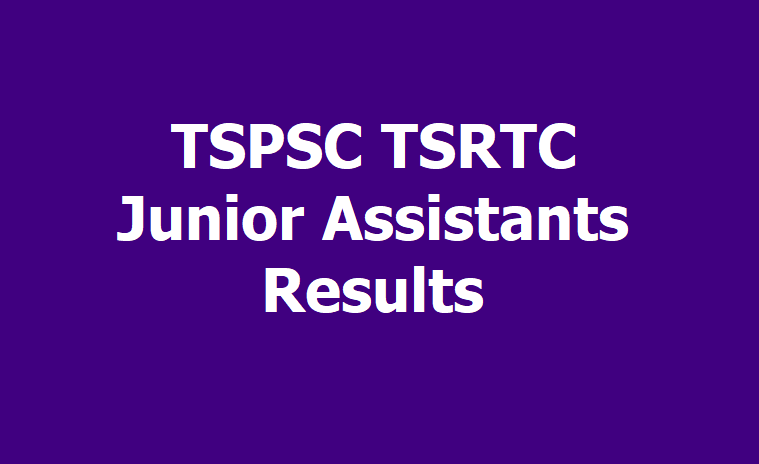 TSPSC TSRTC Junior Assistants Results 2018 declared on March 19, 2019. Candidates can obtain the result from the TSPSC's official website. Telangana State Public Service Commission (TSPSC) has released the merit list of TSRTC Junior Assistants on its official website on March 19, 2019. The candidates who have appeared for the TSRTC Junior Assistants recruitment process can visit the official website of TSPSC- tspsc.gov.in- to check and download their TSRTC Junior Assistants result. The TSPSC TSRTC Junior Assistants recruitment exam was conducted on October 7, 2018, at various centers across the state. The candidates can check their result from the direct link provided below. TSPSC conducted this recruitment drive to fill up 1,867 vacancies. The candidates who have qualified the exam will be posted in various departments such as Bill Collector, Revenue Department, Home Department, Junior Assistant, etc. Note: The candidates if any are admitted in the Merit Lists as per the Court Orders, their admission is purely provisional and subject to outcome of the final judgments in the respective W.Ps/W.As pending before the High Court.